Artland Dragons bolstered their lineup in terms of both size and experience by signing center Petar Popovic, who won the competition with DKV Joventut in 2008. His Artland teammate Demond Mallet also played with Popovic on that title-winning team. Popovic (2.11 meters, 33 years old) arrives from Crvena Zvezda in his native Serbia, where he averaged 11.2 points and 5.3 rebounds in 25 Adriatic League games last season. Artland will be his fourth Eurocup club in as many seasons in the competition. For his career Popovic has averaged 10.4 points in 38 Eurocup games with Hemofarm, Crvena Zvezda and Joventut. He also played one season in the Euroleague with Benetton Treviso. Popovic began his career with Spartak Subotica in Serbia and has also played for Hemofarm and Crvena Zvezda in Serbia, Spartak St. Petersburg in Russia, Joventut and Estudiantes in Spain. Among his career highlights are winning the Italian League with Benetton, the Adriatic League with Hemofarm and the Spanish King’s Cup and Eurocup with Joventut. He has also represented the Serbian national team, with he played at the 2004 Olympic Games in Athens. 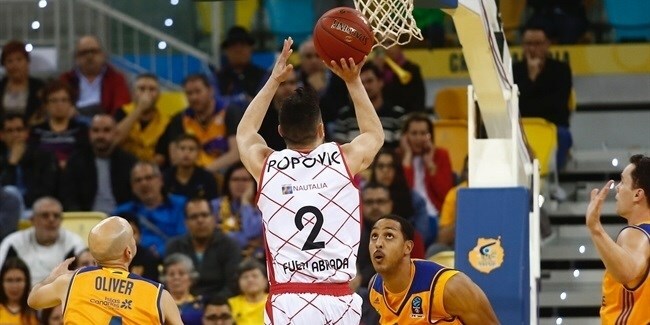 Two-time EuroCup champion Marko Popovic added another title to his storied career on Wednesday by becoming the all-time EuroCup scoring king.